In February 2017 I had two great experiences in our beautiful skies. 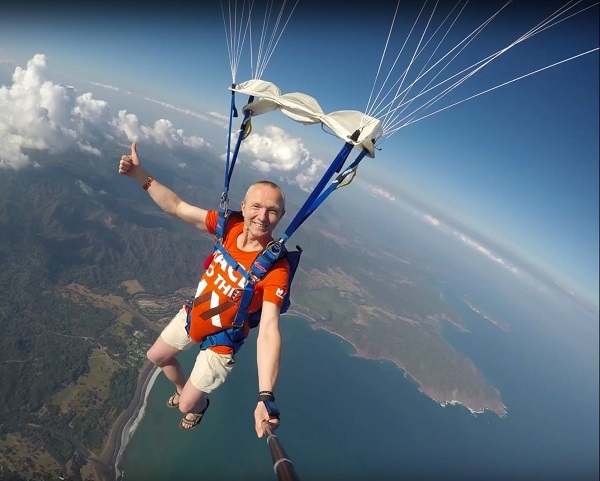 Early February, as part of a group of around a hundred experienced International skydivers, we skydived above Tambor in Costa Rica. The view from above was amazing and landing at the beach in front of the resort made it all very special. 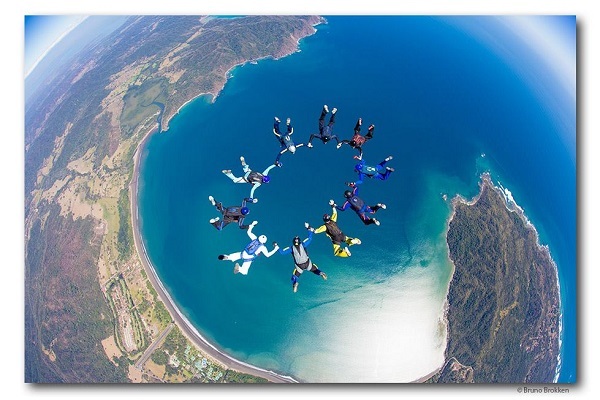 This event has been organized by the US skydive organisation Tsunami Skydivers from Rich Grim. Skydiving above a resort in “the middle of nowhere”, with next door only a very small landing strip, means that a lot of activities needed to be organized. To mention only a few: a skydive plane (Cessna Caravan), thousands liters fuel, transport to and from the drop zone, manifest, safety staff, packers, load organizers, etc. You can imagine that this all is quite a project and it all turned out to be a very well organized event. 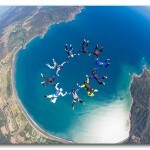 In total I made 19 great skydives, from 16way formations to a so called “hop and pop” at 12.500ft. The skydives (three to four a day) were well organized by the -always smiling- Regan Tetlow and filmed by Bruno Brokken. As we were skydiving in tropical weather conditions we stopped in the afternoon for great (pool) parties. 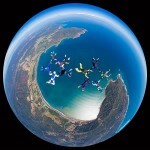 The country and his environment, skydives, weather, nice people and more, made it all an event I will never forget. 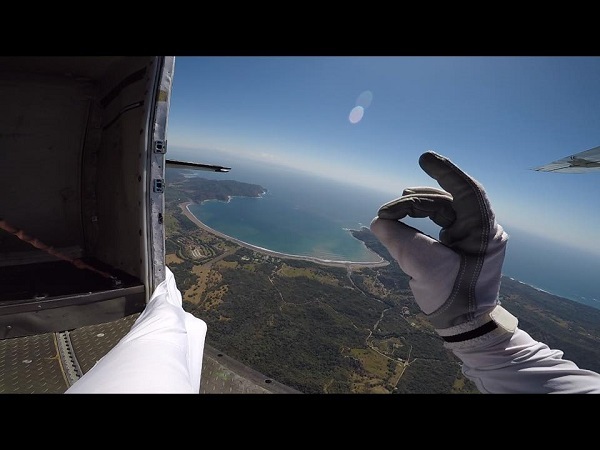 Please find my short movie about the Costa Rica Skydive event here. 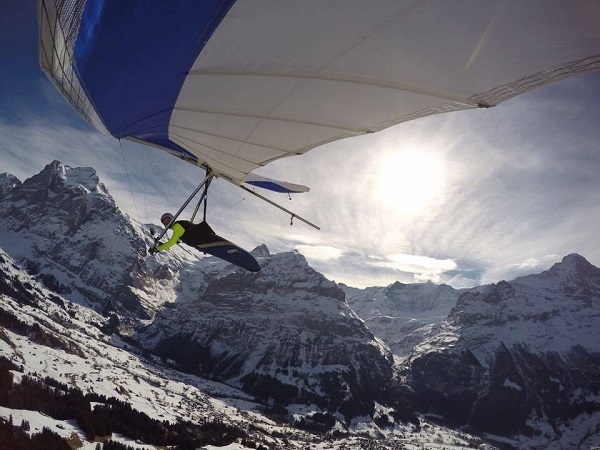 Hang gliding Switzerland towards the Eiger North face. I came back home on a Sunday and the Friday there after I drove towards Switzerland for a ski holiday. 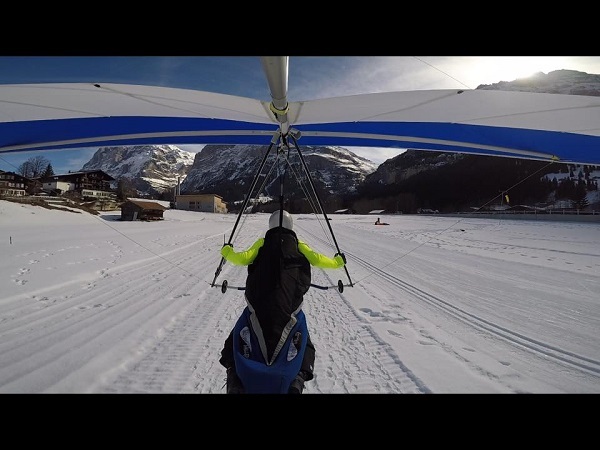 Next to the fact that I love to ski with my family and friends I also had the idea to bring my hang glider to try to fly from a snowy mountain towards the Eiger North face. 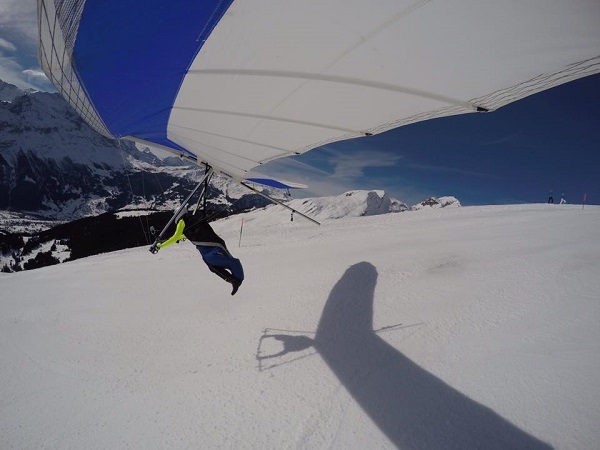 To bring my glider towards Switzerland (Grindelwald) went well. I attached a ladder on the roof of my car with on top my 5,5 meters long hang glider. When we arrived (on Saturday), I learned that the next day the weather would be perfect and possibly the best day of that week to fly. This meant that I had to organize with the lift organisation to get my glider all the way up to the First (above 2100 meters). They agreed to have me To be able to be transport my glider together with the food, drinks etc for the restaurants on the top of the mountain, I needed to bring my glider at 6.30 in the morning to the ski lift. 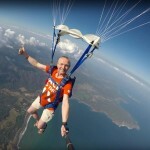 I brought my glider early the next day – with a smile and comments to the lift staff “please take care of my baby”- . Afterwards I went down to Grindelwald Grund to thoroughly check the landing field and possible landing directions. At 9.30 I also went up the mountain and was happy to find my glider was there safe too. 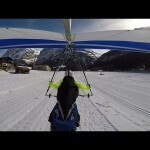 After a tiring and heavy walk of about 300 meters towards my exit point (a black slope) I prepared and checked my glider. Around 12.00 hours I took off and this flight turned out to be one of the most impressive flight ever. After a good take off, the white winter wonderland view was really astonishing. 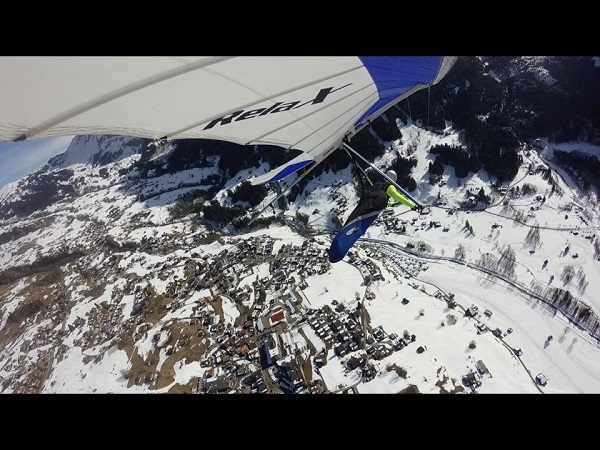 I enjoyed every second of my 15 minutes long flight down to Grindelwald Grund. My approach and landing were perfect too, and the weather conditions did not get better that week. My smile lasted the entire week! Please find a short movie from my impressive flight here. If you would like to know more about one of the two events, please feel free to send me an email and or reaction. P.s. Bruno Brokken made picture 1 and 3 and the others are made by me. 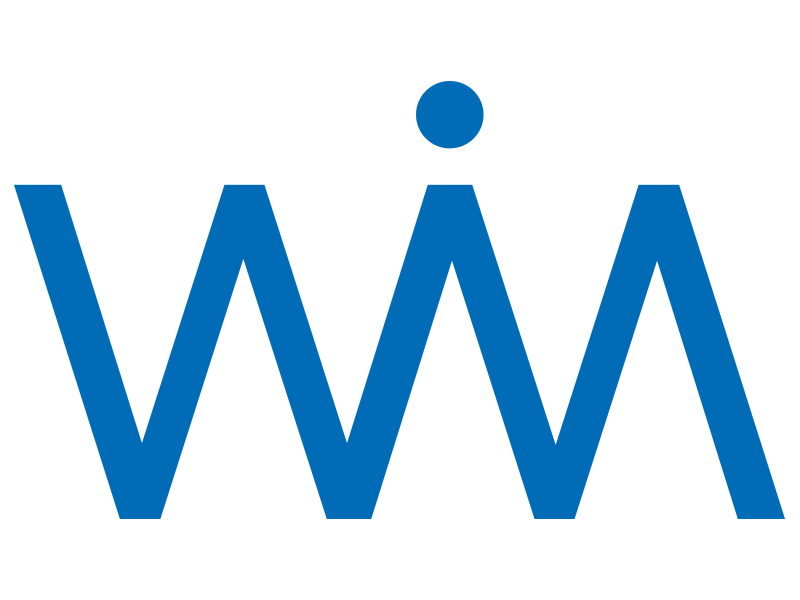 This entry was posted in hang-gliding, skydiving and tagged Costa Rica, deltavliegen, Grindewald, Hang gliding, parachutespringen, skydiving, skywim. Bookmark the permalink. 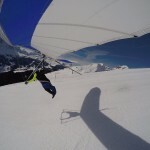 Some of my hang gliding flights.